The Chang’e-3 mission is the second phase of China’s lunar program which includes orbiting, landing and returning to Earth, following the successes of the Chang’e-2 missions, which include plotting a high-resolution, full-coverage lunar map. XICHANG- China will launch the Chang’e-3 lunar probe to the moon at 1:30 a.m. Monday, December 2, 2013 from Xichang Satellite Launch Center, the mission’s launching headquarters said here Saturday. It will be the first time for China to send a spacecraft to soft land on the surface of an extraterrestrial body, where it will conduct surveys on the moon. Facilities at the launching site are in good condition and preparations are going well, according to the headquarters. The probe will be launched to orbit aboard an enhanced Long March-3B carrier which is more than three meters in diameter and 56.4 meters high. The mission will be the 25th launch of the Long March-3B, which is the most powerful launch vehicle in the Long March fleet. Engineers have adopted technologies of high-precision guidance and control, multiple narrow window launches, transmission system for remote sensing, and reduction of the rocket’s deadweight, said Cen Zheng, rocket system commander-in-chief of the mission. 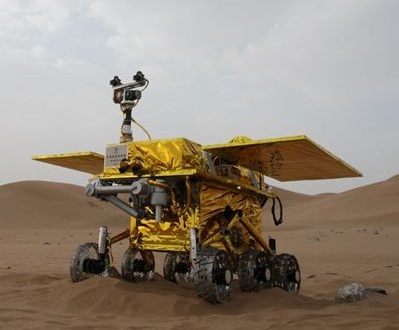 Chang’e-3 comprises a lander and a moon rover called “Yutu” (Jade Rabbit). The lunar probe will land on the moon in mid-December if everything goes according to plan. Tasks for Yutu include surveying the moon’s geological structure and surface substances, while looking for natural resources. So far, only the United States and the former Soviet Union have soft-landed on the moon. After entering lunar orbit, Chang’e-3 will go through six stages of deceleration to descend from 15 km above to the lunar surface. The soft-landing processes of the U.S. and former Soviet Union’s unmanned spacecraft had no capacity to hover or avoid obstacles. Chang’e-3, on the other hand, can accurately survey landforms at the landing site and identify the safest spots on which to land.